Well, that was a little break huh? One day turned into one week and I had not blogged. Some days I'm lacking in creativity and I just don't know what to post. Blogging has changed so much over the years that i feel like my posts have to be original and new just to keep up. I have to keep reminding myself why I started blogging and just get back into the rhythm of it. Anyway, enough of that for this morning. A few weeks ago I met with a potential client who needed help with her kids room. Long story short, she ended up not needing as much help as she thought so she didn't need my services. But we are close in age and she has adorable kids so maybe a friendship is what was meant to come out of it! I'm loving the lavender and red together here, hopefully one day I can design a kids bedroom using these colors! I posted that wonderful glass half full you etched for me last week and got so many wonderful comments. I love your posts and find your style is fresh and fun. What a fun room for any boy or girl. I think the lavender and red together is a hit. It works soo well and those yellow lamps are a cherry on top. Super fab my friend! I never thought about lavender and red. Winning Combo! Cute room. Great job. I like this, and would use it if my kids were younger. My daughter won't move passed purple. Maybe this would be an alternative for her. Ummm might be my new favorite color combination!! I love what you put together!! Love this color combo! I've had purple in all shades on my mind these last couple of weeks. I especially love it when paired with a red or orange. LOVE the purple gingham with the red pom pom trim. Seriously love. Cutest, freshest window treatment I've seen in a while! I just love pairing softer pastels with red, and so many of them work! Lavendar, mint, pale yellow, even pink is perfect with red! Can you source the beds? I am looking for some great beds for my twins! 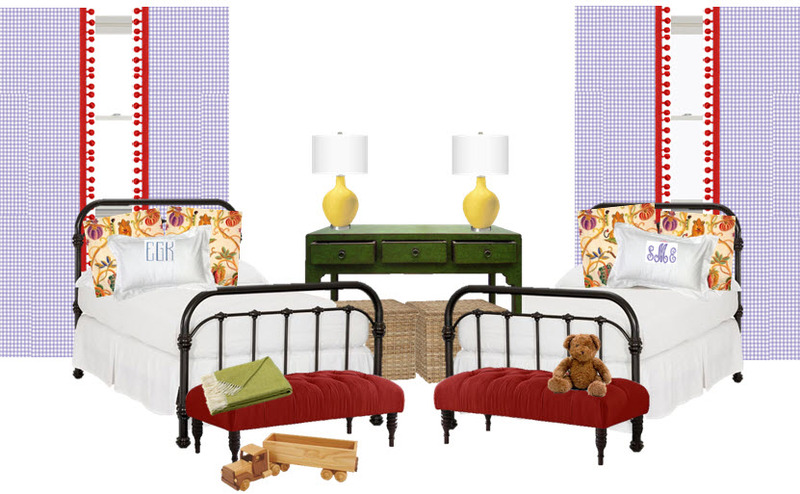 Would have never thought of this combination, but I love it - perfect for a child's room!! I love this color palette!! This really makes me want to redecorate. Mandy Mae- I waited to answer because I went back and searched and searched to see where I found those beds and I cant seem to find them. I am so sorry! I'll keep looking and if I find where I got them I'll email you!